Are you looking for an espresso machine that you can use to make professional quality coffee drinks right in the comfort of your own home? There are a number of espresso makers out there that will get you started in the right direction, but one model that sure seems to have it all is the Breville BES920XL Dual Boiler espresso machine. 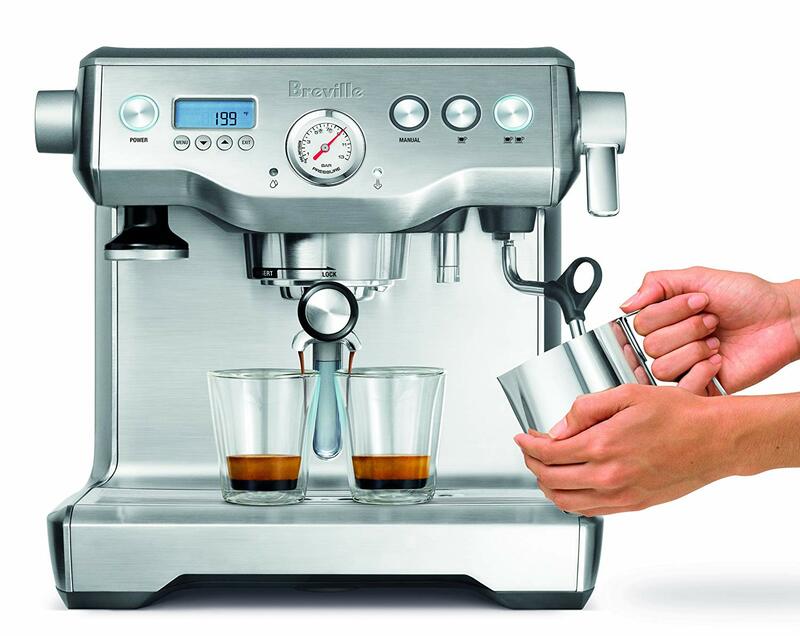 This Breville device is most easily classified as a semi-automatic espresso machine, meaning you’ll still have to man (or woman) the helm as you’re brewing your espresso. The Dual Boiler won’t leave you in the dark though, as it provides you with all the tools you’ll need to make a cup of espresso that you’ll be proud of. Let’s take a closer look at some of its great features. As the name implies, the Breville BES920XL Dual Boiler features not one but two boilers. This means that you can both perform your espresso extraction and steam your milk at the same time. Not only will your coffee be ready more quickly, but also your espresso shot won’t be losing its temperature while you’re busy preparing your steamed milk. The temperature of the water used for the espresso extraction is monitored and controlled with PID logic. This means that the heater can quickly adapt and equilibrate when a temperature fluctuation arises. Using a consistent and accurate temperature during the extraction step is an essential process control for producing a reliably delicious cup of espresso. As if the PID temperature control was not enough, The Breville DES920XL Dual Boiler features a secondary heating element in the group head. Working in conjunction with the water heater this allows for the espresso machine to maintain extraction temperatures within ±2˚F, meaning you’ll be able to precisely tune in the optimal extraction conditions for your coffee beans. A proper espresso extraction starts with a proper pre-infusion. The ground coffee beans need to be exposed to a low-pressure infusion prior to the final extraction. This give the coffee grounds time to soak up the water and expand, filling the chamber evenly and eliminating voids. The Dual Boiler gives you full control over the pre-infusion parameters so that you can dial them in for the perfect cup of espresso. The Dual Boiler espresso machine features an over pressure valve (OPV) that limits how much pressure can be applied during the extraction. An extraction pressure that is too high can lead to impurities in your finished coffee product, leading to off flavors such as bitterness. The OPV ensures that the extraction pressure remains in the proper range throughout the whole process. Making rich and delicious foam is incredibly easy using the built-in steam wand on the Dual Boiler. A dedicated water boiler provides the steam, and the wand incorporates air into the steam to create microbubbles in the milk foam. This leads to steamed milk that is bursting with flavor and rich, velvety texture not unlike what you’d expect from a coffee shop. The Breville DES920XL Dual Boiler utilizes an LCD display to show temperature and other useful programming parameters. It also features a shot clock to help you monitor your espresso extractions. When not in use the display will show you the time. The LCD is also backlit, which makes it easy to use any time of the day – morning, day, or night. Many home espresso machines are large and cumbersome, and they can often take up quite a bit of counter space as a result. The Breville DES920XL Dual Boiler was designed with this in mind, and the footprint was chosen to demand as little counter space as possible. As long as your kitchen permits, you’ll have room for this appliance and more. Features two boilers so that you can brew your espresso and steam your milk side by side, saving you time and helping prevent your coffee drink from cooling before you enjoy it. Utilizes PID temperature control in conjunction with a group head heating element to hold an impressively consistent temperature during espresso extraction. Allows for a customizable pre-infusion to ensure that your coffee beans are properly saturated and set before proceeding to the final extraction. Displays the extraction temperature setting, a shot clock, and the time on the built-in backlit LCD display for easy programming and viewing. Comes equipped with a high quality steam wand that creates rich textured and flavorful milk foam for cappuccinos, lattes, and other coffee drinks. Comes backed by a two year limited warranty from the manufacturer. Some users feel that while the Dual Boiler espresso machine is well designed and engineered, there are some components that could be made from higher quality materials that may need to be replaced in the longer term. If you’re looking for a home espresso machine that’s on the higher end of the middle price range, then the Breville BES920XL Dual Boiler espresso machine should make it to your short list at the very least. It doesn’t have all of the bells and whistles that some of the super automatic espresso machines by Breville boast, but the features that it does have still pack quite the punch. You’ll still have to grind, pack, and tamp your own beans, and much of the extraction procedure is relatively manual, but the Dual Boiler does give an excellent level of control over the extraction temperature. Moreover, it gives you all that you need to monitor the extraction times and pressures, so that you can learn from your experiences and work towards your goal of crafting the perfect cup of espresso. That’s more than what many of the espresso machines in the mid-range of the market place can offer. Add in the excellent quality steam wand, and you’ll have more than enough power at your fingertips to convince your friends, your family, and even yourself that you are your town’s next up-and-coming barista. When compared to other espresso machines in this price range it’s difficult to match the quality of the features offered by the Dual Boiler.